Lynch Since 1940 provides a 30-Day Return Window (see Return of Non-Defective Products below) and the following limited warranty. 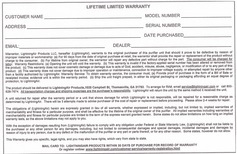 This limited warranty extends only to the original purchaser. Please note that any warranty services or questions must be accompanied by the order receipt from the transaction through which the warranted product was purchased. The order receipt serves as your warranty number and must be retained. Lynch Since 1940 will offer no warranty service without this number. Lynch Since 1940 warrants this product and its parts against defects in materials or workmanship for one year from the original ship date. During this period, Lynch Since 1940 will repair or replace defective parts with new or reconditioned parts at Lynch Since 1940's option, without charge to you. Shipping fees incurred from returns for under-warranty service in the first 30-days will be paid by Lynch Since 1940. All shipping fees both to and from Lynch Since 1940 following this 30-day period must be paid by the customer. All returns, both during and following the 30-day period, must be affected via the Procedures for Obtaining Warranty Service described below. All original parts (parts installed by Lynch Since 1940 at the original system build) replaced by Lynch Since 1940 or its authorized service center, become the property of Lynch Since 1940. Any after-market additions or modifications will not be warranted. The owner is responsible for the payment, at current rates, for any service or repair outside the scope of this limited warranty. Lynch Since 1940 makes no other warranty, either express or implied, including but not limited to implied warranties of merchantability, fitness for a particular purpose, or conformity to any representation or description, with respect to this product other than as set forth below. Lynch Since 1940 makes no warranty or representation, either express or implied, with respect to any other manufacturer’s product or documentation, its quality, performance, merchantability, fitness for a particular purpose, or conformity to any representation or description. Except as provided below, Lynch Since 1940 is not liable for any loss, cost, expense, inconvenience or damage that may result from use or inability to use the product. Under no circumstances shall Lynch Since 1940 be liable for any loss, cost, expense, inconvenience or damage exceeding the purchase price of the product. 2. This warranty covers only normal use of the product. Lynch Since 1940 shall not be liable under this warranty if any damage or defect results from (i) misuse, abuse, neglect, improper shipping or installation; (ii) disasters such as fire, flood, lightning or natural disasters; or (iii) service or alteration by anyone other than an authorized Lynch Since 1940 representative; (iv) damages incurred through irresponsible use, including those resulting from poor maintenance and storage, or other non-recommended practices. 5. Lynch Since 1940 accepts no responsibility for any parts of any products returned for repair to Lynch Since 1940. If repairs are required, the customer must obtain a RMA number and provide proof of purchase. RMA and services are rendered by Lynch Since 1940 only. Any shipping costs after 30 days (starting from the original date of purchase) on any item returned for repair is the customers’ responsibility. All returned parts must have a RMA number written clearly on the outside of the package along with a letter detailing the problems and a copy of the original proof of purchase. No COD packages will be accepted. No package will be accepted without a RMA number written on the outside of the package. RMA numbers are only valid for 30 days from the date of issue. Upon receiving the item, Lynch Since 1940 will repair or replace your product (at Lynch Since 1940's discretion) and will ship it back to you within 2 weeks (dependent on parts availability) via UPS or USPS. Lynch Since 1940 will pay for shipping to and from the customer only within the first thirty days following the original product ship date. Following this 30-day period all shipping fees both for under warranty and post warranty repairs are the sole responsibility of the customer. The customer also assumes full liability for losses or damages resulting from shipping as well as all responsibility to pursue remuneration for such issues with their selected carrier. For post warranty repair, the procedure is the same as outlined above for RMA and shipping. However, you are responsible for shipping charges both ways, current labor, and the current price of part(s) used in repair. This warranty is null and void if the defect or malfunction was due to damage resulting from operation not within manufacturer specifications. It will also be null and void if there are indications of misuse and/or abuse. Under no circumstances will Lynch Since 1940 be responsible for any refund or remuneration exceeding the original purchase price of the product less any shipping fees. Lynch Since 1940 will not be held responsible for typographical errors on sales receipts, repair tickets, or on our website. Lynch Since 1940 makes every effort to make sure all information on our website is correct. We only replace items if they are defective or damaged. If you need to exchange it for the same item, send us an email at charlie@lynchtraditions.com and send your item to: 1025 Campbell Street, Thomasville, GA, 31792, United States. To return your product, you should mail your product to: Lynch Since 1940, 1025 Campbell Street, Thomasville, GA, 31792, United States. This website is operated by Lynch Since 1940. Throughout the site, the terms “we”, “us” and “our” refer to Lynch Since 1940. Lynch Since 1940 offers this website, including all information, tools and services available from this site to you, the user, conditioned upon your acceptance of all terms, conditions, policies and notices stated here. Our store is hosted Stripe. They provide us with the online e-commerce platform that allows us to sell our products and services to you. In no case shall Lynch Since 1940, our directors, officers, employees, affiliates, agents, contractors, interns, suppliers, service providers or licensors be liable for any injury, loss, claim, or any direct, indirect, incidental, punitive, special, or consequential damages of any kind, including, without limitation lost profits, lost revenue, lost savings, loss of data, replacement costs, or any similar damages, whether based in contract, tort (including negligence), strict liability or otherwise, arising from your use of any of the service or any products procured using the service, or for any other claim related in any way to your use of the service or any product, including, but not limited to, any errors or omissions in any content, or any loss or damage of any kind incurred as a result of the use of the service or any content (or product) posted, transmitted, or otherwise made available via the service, even if advised of their possibility. Because some states or jurisdictions do not allow the exclusion or the limitation of liability for consequential or incidental damages, in such states or jurisdictions, our liability shall be limited to the maximum extent permitted by law. You agree to indemnify, defend and hold harmless Lynch Since 1940 and our parent, subsidiaries, affiliates, partners, officers, directors, agents, contractors, licensors, service providers, subcontractors, suppliers, interns and employees, harmless from any claim or demand, including reasonable attorneys’ fees, made by any third-party due to or arising out of your breach of these Terms of Service or the documents they incorporate by reference, or your violation of any law or the rights of a third-party. These Terms of Service and any separate agreements whereby we provide you Services shall be governed by and construed in accordance with the laws of 1025 Campbell Street, Thomasville, GA, 31792, United States.